Dragon boat racing is a traditional annual activity in Fenghuang Ancient Town, held during the Dragon Boat Festival and the two preceding days (June 7 – June 7, 2019). After the races, capturing ducks pushes the climax of the game to another tipping point, and this phenomenon cannot be viewed in other places and periods. Looking on from the Tujia Diaojiaolou (Tujia minority &apos;drooping-corner&apos; buildings) beside the Tuo River, you can observe this unique folk custom. “Duck capturing” is a rarely seen sport. This simple folk custom, mingled with a bit of wildness, reminds well-read Chinese of Shen Congwen’s novel Border Town. Read more on Dragon Boat Festival Traditions. The old town of Fenghuang (&apos;Phoenix&apos;), in the west of South China&apos;s Hunan Province, is a historical and cultural old town. Rewi Alley, a famous Australian writer, once described it as one of the most beautiful cities in China. The town maintains this traditional as part of its rich culture. Dragon boat racing in Fenghuang appeared in famous Chinese writer Shen Congwen’s Border Town to express the pride and wild nature amongst the unsophisticated common people. 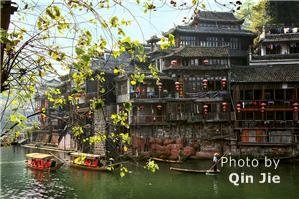 In Fenghuang you can go boating on the Tuo River, wander through the old streets, enjoy a wonderful trip to a Miao house, appreciate Miao dancing, and taste the delicious food of western Hunan Province. China Highlights can help you arrange a tour to see this interesting festival and ancient town.